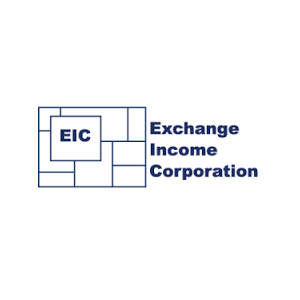 Exchange Income Corporation is a diversified, acquisition-oriented corporation focusing on opportunities in aerospace and aviation services and equipment, and manufacturing. The corporation enjoys a diversified revenue stream from businesses ranging from medevac transportation services, aftermarket aviation parts, to communication tower construction, high pressure water cleaning systems, and precision metal manufacturing, and more. Its Provincial subsidiary is a global leader in maritime surveillance servicing governments around the world. Exchange Income owns a unique group of companies in the aviation and manufacturing sectors. It offers a wide range of operations within the aerospace and aviation industries including providing scheduled airline, charter service, and emergency medical service to communities located across different regions. The corporation also provides a variety of manufactured goods and services in a number of industries and markets throughout North America. The principal operating subsidiaries of the Corporation are Bearskin Lake Air Service, Calm Air International, Custom Helicopters, Keewatin Air, Perimeter Aviation, Provincial Aerospace, Regional One, Quest Window Systems etc. Exchange Income’s segments are Aerospace & Aviation (Legacy Airlines, Regional One, and Provincial) and Manufacturing. Exchange Income has grown approximately six times over the eight-year period and has been successful in compounding its revenue at an impressive 19% per annum over the last five years. Exchange Income enjoys a diversified revenue stream from different markets and geographies around the globe. During the last year, a major portion of earnings growth was generated by the Manufacturing segment, driven by robust customer demand. The majority of this increase was from the acquisition of Quest and organic growth. Other manufacturing entities like WesTower, Ben Machine, and the Alberta Operations also demonstrated good performance. The increase in Aerospace & Aviation earnings was primarily driven by the acquisition of Moncton Flight College, higher revenue and operational efficiencies. Its acquisition of Moncton Flight College has enabled the corporation to train and maintain its own source of new pilots, which will act as a significant competitive advantage in the future. Another new acquisition, Quest Windows contributed significantly to Exchange Income’s growth in 2018. The corporation is setting up a new Quest facility in Texas which is expected to open in 2019 and more than double its existing capacity. The corporation continually invests to increase infrastructure to support its operations, additional aircraft and base, and for the replacement of production equipment or components. Exchange Income is in a good position to expand its service offerings to customers given its multiple diversified subsidiaries. It should also benefit from high levels of defence spending worldwide and steady economic recovery in its markets. Exchange Income has one of the best track records of dividend growth on the Canadian stock exchange. A diversified business model, disciplined investment, and acquisition of companies with steady cash flows have supported dividend growth over the years. This Canadian Dividend Aristocrat last raised its dividend payout by 4.3% and compounded them at 7.5% per annum over the last three years. A diverse group of subsidiaries providing a resilient cash flow stream has facilitated its dividend to grow. These businesses have recurring revenue streams throughout their business cycle and the distinct nature of businesses adds diversity during times of any fluctuations. Exchange Income has experienced double digit growth in each of the last five years. The corporation is estimating 2019 EBITDA to increase by 10%-15% and free cash flow is also expected to increase by 8-12%. This growth is expected to be driven by existing operations and no new acquisitions or major capital investment. The corporation grows by acquiring quality businesses characterized by strong management teams, generating steady cash flow and being immediately accretive to its earnings. A sound track record and reputation of helping the acquired companies to grow their businesses have made Exchange Income the preferred choice of many selling companies. Exchange Income faces competition from domestic as well as international companies. Air Canada, Westjet Airlines, Chorus Aviation, Canada Jetlines, Ace Aviation are Exchange Income’s leading competitors. These are leading airline companies in Canada. Exchange Income’s strategy of acquiring companies that operate in the milder competitive environment and offer niche services in remote areas make it an unparalleled leader. A large portfolio of subsidiary companies catering to aviation and manufacturing sectors of the economy is Exchange Income’s biggest competitive advantage. Its long standing strategy of acquiring diversified businesses not only mitigates risks but also provides opportunities for growth. Exchange Income is a good income generating stock with huge growth potential. Organic growth and contributions from acquisitions should drive strong earnings growth and support future dividend increases. However, I prefer CAE and the business model of CAE in the aviation industry but you will have a much lower dividend yield.